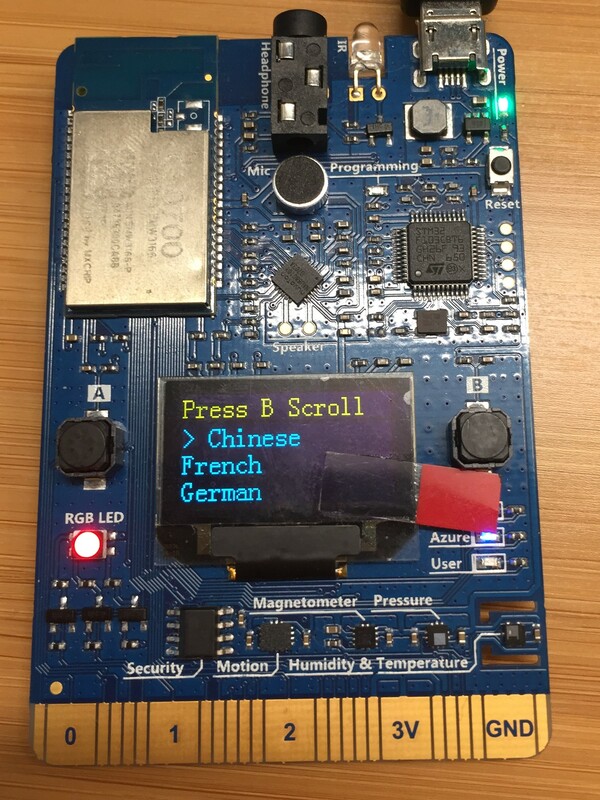 In this article, you learn how to make IoT DevKit as a language translator by using Azure Cognitive Services. It records your voice and translates it to English text shown on the DevKit screen. In the Azure portal, click Create a resource and search for Speech. Fill out the form to create the Speech Service. Go to the Speech service you just created, click Keys section to copy and note down the Key1 for DevKit accessing to it. Make sure your IoT DevKit is not connected to your computer. Start VS Code first, and then connect the DevKit to your computer. In the IoT Workbench Examples page, find DevKit Translator and click Open Sample. Then selects the default path to download the sample code. Follow the steps to finish provisioning of Azure IoT Hub and Azure Functions. Take a note of the Azure IoT Hub device name you created. Open Functions\DevKitTranslatorFunction.cs and update the following lines of code with the device name and Speech Service key you noted down. // Region of the speech service, see https://docs.microsoft.com/azure/cognitive-services/speech-service/regions for more details. 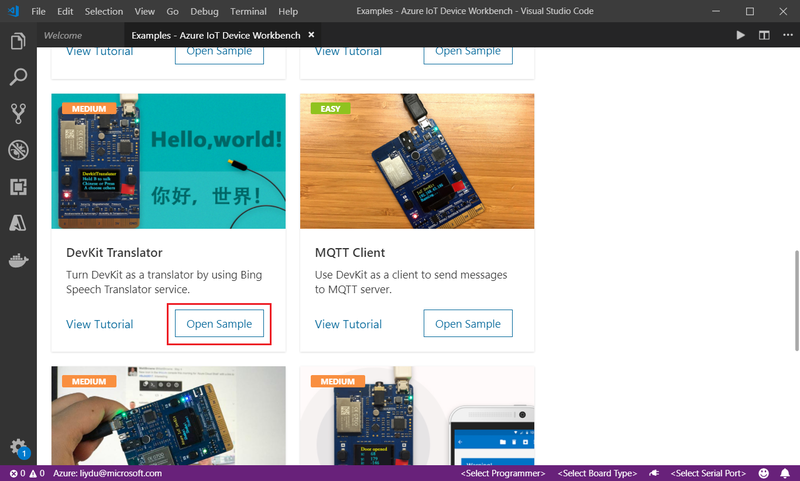 Click F1, type and select Azure IoT Device Workbench: Deploy to Azure.... If VS Code asks for confirmation for redeployment, click Yes. Make sure the deployment is successful. In Azure portal, go to Functions Apps section, find the Azure Function app just created. Click devkit_translator, then click </> Get Function URL to copy the URL. Paste the URL into azure_config.h file. If the Function app does not work properly, check this FAQ section to resolve it. Press and release Reset button. You will see the screen displays the DevKit ID and Configuration. Click F1, type and select Azure IoT Device Workbench: Configure Device Settings... > Config Device Connection String. Select Select IoT Hub Device Connection String to configure it to the DevKit. You will see the notification once it's done successfully. Click F1 again, type and select Azure IoT Device Workbench: Upload Device Code. It starts compile and upload the code to DevKit. After app initialization, follow the instructions on the DevKit screen. The default source language is Chinese. Press button A to enter setup mode. Press button B to scroll all supported source languages. Press button A to confirm your choice of source language. Press and hold button B while speaking, then release button B to initiate the translation. The translated text in English shows on the screen. Press buttons A and B to scroll and select the source language. Press the B button to talk. To send the voice and get the translation text, release the B button. 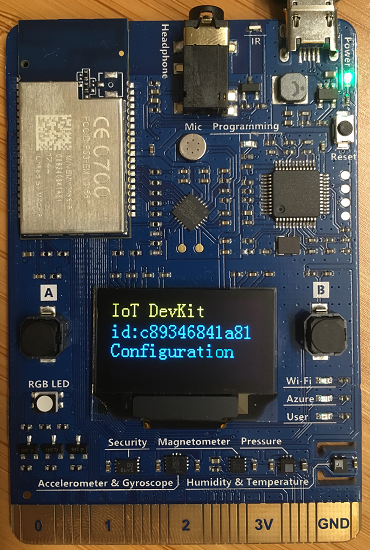 The IoT DevKit records your voice then posts an HTTP request to trigger Azure Functions. Azure Functions calls the cognitive service speech translator API to do the translation. 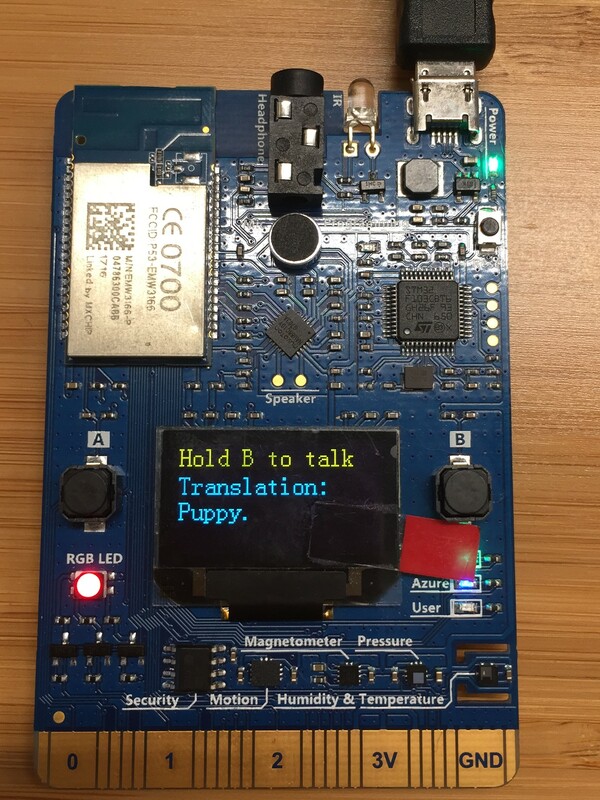 After Azure Functions gets the translation text, it sends a C2D message to the device. Then the translation is displayed on the screen.